Everton‘s clash against the juggernaught Chelsea at Stamford Bridge was not televised over here in the states, so I watched the first half via gamecast on ESPN.com. 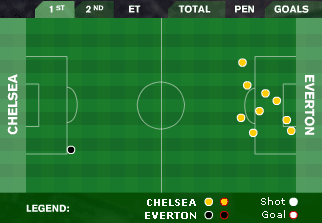 As you can see from the shots on goal, the game seemed quite one-sided (the graphic shows the first half action – yellow dots are Chelsea’s shots, the black dot was Everton’s only first half chance). During halftime, I did some research and found a helpful site, myp2p.eu that streams live european sporting events! The site’s design is awful, but the function it serves is fantastic! While I was not overly impressed with the quality (it’s not like ABC’s video player), it was at least equal to “youtube” quality. But more importantly, I WAS ABLE TO WATCH THE GAME (well the second half at least). And what a second half it was… At halftime David Moyes subbed in Victor Anichebe and James McFadden in hopes of creating some sort of attack to keep Chelsea honest and maybe steal a goal. “SuperSub”Anichebe and Scotland’s hero McFadden did a respectable job keeping a little pressure on the rare chances they could create. At the other end of the pitch, Chelsea continued to pepper USA goalkeeper Tim Howard with shots, but the defense proved up to the task (thanks to impressive performances from Jolean Lescott and Tim Howard). Chelsea finally broke the stalemate in the 70th minute when Didier Drogba headed a corner past Howard. Poor marking, but an excellent goal from one of the EPL’s top strikers. Thinking they had it won, Chelsea didn’t press the ball quite as much and in the 89th minute, Everton made them pay with this GLORIOUS bicycle kick goal from my favorite Toffee, Tim Cahill. Goals don’t get much better than that beauty – an equalizer at the death, away at one of the giants … 6 games in a row unbeaten for Everton (5 wins and a draw), my Blues are making me proud! Wow, that was really impressive. Though I must confess, I actually thought the Tim Cahill referenced in the subject was going to be one of my favorite authors instead of a soccer player. Now that would have been even more impressive! Funny you mention that, as “my” Tim Cahill is also an author! Not quite as well known for writing as your favorite author, but I can get behind his idea for a kids book.